NIA Charlestown Nevis — The St. Kitts/Nevis & Friends Association based in England donated a cheque of £600 to the Charlestown Secondary School on March 26, 2014 during a brief handing over ceremony at the school’s auditorium. Chairman of the Association, Randolph Charles, an alumnus of the Charlestown Secondary School, on behalf of his Association donated the cheque to the school to assist in purchasing a smart board in an effort to contribute to the education of the students through advanced technology. “I am here really to support the school because when I came last year October, I noticed there was one smart board. It is an interactive smart board that you can actually go into the Internet and you can do research. I felt it could be useful if we could support the school with a second smart board so that the students can have the opportunity to utilise it and to work with it, to use it for research because it is well known that if you are actively involved in your education it is much better for you,” Charles explained. 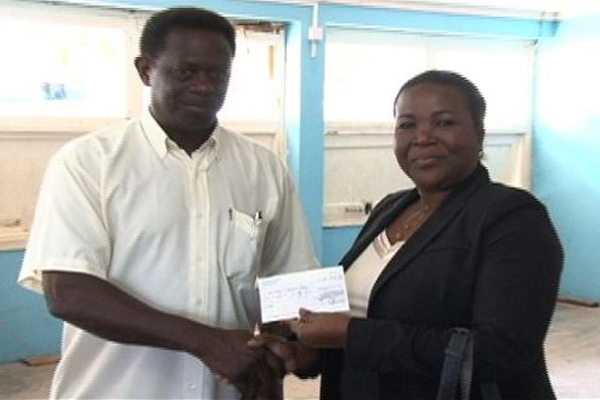 Permanent Secretary in the Ministry of Education Lornette Queeley-Connor, who received the donation on behalf of the Ministry of Education, expressed gratitude for the contribution. “Thank you very much Counsellor Charles…I want you, Sir, to convey our deepest appreciation to your Association and to let them know that this contribution is deemed extremely significant and it will be put to its fullest use,” she said. Principal of the Charlestown Secondary School Edson Elliott, who received the cheque on behalf of the school from the Permanent Secretary, stated that the donation came at a convenient time, just days after the Educational Network (EduNET) had been launched at the school. “This contribution has come on the heels of the launch of the EduNET Internet services where very shortly all students and teachers will be able to access the internet via Wi-Fi and the use of the smart board certainly will go a long way for teachers to be able to impart the knowledge of technology and for them to be able to educate the students with respect to the research and using the Internet as a very useful tool that we know that it is. So on behalf of the entire institution we would like to thank Mr. Charles,” Elliott said.